Our solid bronze vent covers are handmade by Classic Grilles and are sand cast, making each one unique. The Craftsman bungalow style covers are also each finished in your choice of light, antique or dark bronze patinas which will be hand rubbed onto the faceplate. Quality bronze vent covers are hard to come by, but these 1/4" thick units are made right here in America. Use the bungalow style covers on your wall, ceiling or even in your floor since they are durable enough to support weight. Please note floor use in the customer comments section during checkout. Screws come with the bronze vent cover, allowing quick installation of the unit. These bungalow style grilles have a square by square design to allow even airflow distribution throughout your home. Behind the bronze vent cover, there is a metal screen, painted black, that will help hide your ductwork from showing through the design. Our Craftsman bungalow style covers are ordered according to your hole opening in the wall and will have a slightly larger faceplate for installation purposes. Tip: Our bronze vent covers are hand crafted so dimensions of actual vent can vary slightly. Order the vents according to your hole opening in the floor or wall. The 24 x 10 bungalow style grille will fit over a hole measuring 24 x 10 inches. The actual faceplate of the unit will be about 2 inches larger than listed size. Important: The solid bronze vent covers will take about 7 to 9 weeks to ship once an order has been placed. Since the bungalow style vents are hand cast, they are considered a special ordered item which is non returnable and cannot be canceled once purchase is made. 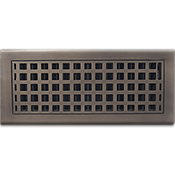 Find more bronze vent cover options, which are made by Classic Grilles, in our wall return section. Also, note that this bungalow style grille can also be purchased with a damper box which will adjust the airflow in your home. Purchase the bronze vent cover today by calling and ordering it with us. Your home and family will thank you later.